Long before halftime Saturday, the Chattanooga Football Club had to deem its biggest game ever an unqualified success. Thousands were in the stands at Finley Stadium, the food and beverage vendors were doing brisk business and, by the way, the second-year amateur club was leading the under-23 team from Fútbol Club Atlas of Guadalajara, Mexico. "Everything's going great, and I guess I don't have to knock on wood anymore," a relaxed-looking CFC co-founder Tim Kelly said near halftime. By the time the game was over, the entire production had gone off without a hitch. Chattanooga FC pulled off a 2-1 win in front of an announced crowd of 6,317. "It was terrific, just a great night," CFC coach Brian Crossman said. "I'm so glad the (CFC) committee decided to bring these guys up ... because it was fun to watch those guys play." Staff photo by Jake Daniels/Chattanooga Times Free Press Joshua Scott, Robert Hill, Chris Ochieng, Russell Courtney, and Andrew Stewart, from front to back, pose for a group portrait in the new Chattanooga FC jerseys supplied by Volkswagen. 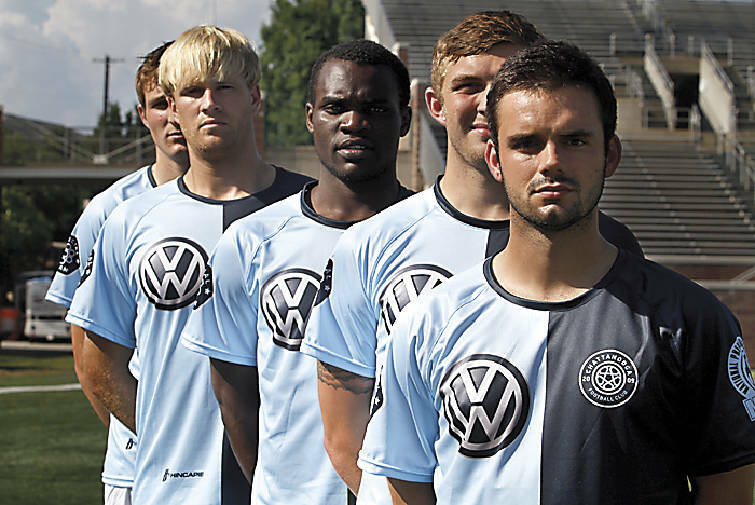 The automobile manufacturer has signed on as the title sponsor of the Chattanooga FC, whose jerseys now sport the VW logo. The crowd was the second-largest ever to see a soccer game at Finley, which opened in 1997. The largest was in November 1997, when more than 13,000 people saw the U.S. women's soccer team beat Sweden 3-1. "We hoped that we would have penetrated the Hispanic community a little better, but we tried," Kelly said. "There's a good contingent, but hopefully if they see the quality product, that will spread and word will spread in the community and we'll have better attendance through the regular season." More than an hour before CFC's home opener began, many fans were tailgating outside the stadium. There was a colorful mix of people inside Finley with, according to a public-address announcement, members of the crowd hailing from countries throughout North and Central America and beyond. Finley was decorated to demonstrate that diversity with 32 international flags flying atop the south section. Before the game, the Atlas club visited Hamilton Place mall - going to a mall was the one thing the players asked to do - and the Tennessee Aquarium. Atlas coach Luis Alberto Padilla Velazco said the weekend in Chattanooga was a good experience for his players and good for soccer in this area. "For us it's very important to be the first ones to come here and play against (CFC), and also to come to this area and promote soccer," Velazco said through an interpreter. "We'll be very interested to play them again." Russell Courtney put CFC up 1-0 in the 15th minute with a header goal off the bottom of the crossbar following a direct kick from Joshua Scott. That seemed to relax the team and energize the crowd, at least the portion that was pulling for CFC - and a large percentage of the Hispanic turnout was rooting for the visitors. "I think it was a big boost of emotion," Courtney said of his goal. "It just kind of helped us from there, showed us that we can hang with these guys." Chattanooga FC went up 2-0 late in the game on a direct-kick goal from just outside the box by Irvin Espinal. Atlas' goal came in the 90th minute on a beautiful bending shot by Jorge Aquiles Alcala Hernandez.